This paper reports on a study that explored how faculty who take on technology leadership roles developed TPACK knowledge and built capacity for technology-enhanced teaching. The study was the second phase of a professional development initiative, called the Digital Pedagogies Collaboration, in a Faculty of Education. Four faculty, who had participated in technology workshops, volunteered to conduct workshops on technologies they had integrated into their own instruction. A qualitative case study design was used and data included pre- and post- interviews, videotaped technology workshops, and workshop artifacts. Findings show that taking on a leadership role as a workshop facilitator improved faculty members’ knowledge and skills around teaching with technology (TPACK). Moreover, the TPACK-based Professional Learning Design Model (TPLDM) was useful for designing content- centric workshops and the Faculty as Technology Leaders was a component that extended the TPACK Leadership Theory of Action Model (Thomas, Herring, Redmond, & Smaldino, 2013). Kamini Jaipal-Jamani is a Professor in the Faculty of Education. Her research and publications focus on science teaching and learning, technology integration, and teacher professional development. Her current program of research includes an examination of the use of robotics to promote science learning and computational thinking in K-12 and teacher education contexts. Candace Figg is Associate Professor in the Faculty of Education. Her research interests include the development of Technological Pedagogical and Content Knowledge (TPACK), the impact of technology leadership on technology use in classrooms, and the influence of mobile and emerging technologies on 21st century teaching and learning. Diane Collier is an Associate Professor in the Faculty of Education. She conductes research in the areas of multimodalities and literacies using qualitative and ethnographic case study methodologies. Other research interests include teaching for social justice and the use of children's literature in classrooms. Tiffany Gallagher is an Associate Professor in the Faculty of Education. Her research areas include literacy assessment, reading and writing strategy instruction, disciplinary literacy, the role of the literacy coach, teachers with learning disabilities, and exceptional learners and inclusion. Kari-Lynn Winters is an Associate Professor in the Faculty of Education and a Canadian children’s author and playwright. Her research focuses on teacher education, multimodal authorship, arts integration, and children’s literature. Katia Ciampa is an Assistant Professor in the Center for Education. Her research interests include multiliteracies, the role of motivation in literacy learning, and supporting pre-service teachers’ literacy instructional practices. Creswell, J. W. (2012). Qualitative inquiry and research design: Choosing among fi	approaches. Thousand Oaks, CA: Sage. Ertmer, P. A., & Ottenbreit-Leftwich, A. T. (2010). Teacher technology change: How knowledge, confi beliefs, and culture intersect. Journal of Research on Technology in Education, 42(3), 255-284. (pp. 99-108). Chesapeake, VA: SITE. Harris, J. B., Hofer, M. J., Blanchard, M. R., Grandgenett, N. F., Schmidt, D. A., van Olphen, M., & Young, C. A. (2010). “Grounded” technology integration: Instructional planning using curriculum-based activity type taxonomies. 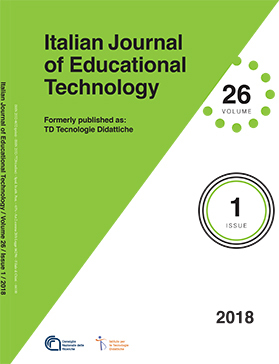 Journal of Technology and Teacher Education, 18(4), 573-605.
International Society for Technology in Education. (2002). National educational technology standards for teachers: Preparing teachers to use technology. Eugene, OR. Jaipal-Jamani, K., & Figg, C. (2015). A Framework for TPACK-in-Practice: Designing Technology Professional Learning Contexts to Develop Teacher Technology Knowledge (TPACK). In N. Valanides & C. Angeli (Eds. ), Exploring, developing, and assessing TPCK (pp. 137-164). New York, NY: Springer. Kivunja, C. (2013). Embedding Digital Pedagogy in Pre-Service Higher Education to Better Prepare Teachers for the Digital Generation. International Journal of Higher Education, 2(4), 131-142. Piano Clark, V. L., & Creswell, J.W. (2015). Understanding research: a consumer’s guide (2nd ed.). Upper Saddle River, NJ: Pearson. Yin, R. K. (2014). Case Study Research Design and Methods (5th ed.). Thousand Oaks, CA: Sage.